And, you will only know what gear you forget when you arrive at the travel destination. Can you buy the travel gear you need, and want upon arrival; well that is the million dollar question isn’t it? Buying Travel Gear Outside the USA is S.N.A.F.U. Yes, we can buy travel gear in Europe, but cost 2-5 times more than in the USA, the only country with similar buying power is Canada. Buying travel gear outside the USA is an uphill battle, the farther you wander from home, the more difficult it becomes. “What travel gear do I need? When I plan a trip to Europe it scares me to death, I remember wanting to buy a sweatshirt while in England. I and Peter walked around in Bristol, England for hours looking for one at an acceptable price. While in the USA, I can walk into any Wal-Mart, and buy an 8-10 dollar throwaway sweatshirt, with no problem, but in Europe, they are sort of opposed to large discount shopping. Anything that is packed for travel, is travel gear, most of my gear is stacked into four piles. 1. Trashable gear, when I leave the country, I will dump it, I do not love it, and I am willing to trash it. 2. Essential gear, stuff that is difficult to buy, we can live without it, but generally want it. For example, my Djampe wash net I sell is essential gear, but I can live without, but I need it. When you get to the airport, and suddenly they want 200 dollars for luggage that is overweight. The stuff you leave sitting on the floor next to the check in counter is non-essential. 3. Random stuff - The pants, that can be replaced, the shirt that can be replaced, the thing I can buy in most countries. Now most travel writers lie, in reality, the normal one has not even travel enough to carry my backpack, halfway give me advice on travel gear. They generally talk fools gold, things like Apple Ipad, and too stupid for words “Camel Back Water Systems,” truly made to make money travel gear, and naïve at best. But, I am going to write something three times. 1. You and me are different, what you need is different. 2. You and me are different, what you need is different. 3. You and me are different, what you need is different. I am making that phrase as high as priority as possible, and let me shout it. For example, buying woman’s tampax can be close to impossible in African countries. This is not my problem, I am male. Here are few things I never leave home without. 1. Swimsuit, it is amazing how many activates need a swimsuit, from Jacuzzis to visiting waterfalls, the are not just for beach. One time in Tibel, we went to a group wash house, and I did not want my normal clothes wet. 2. 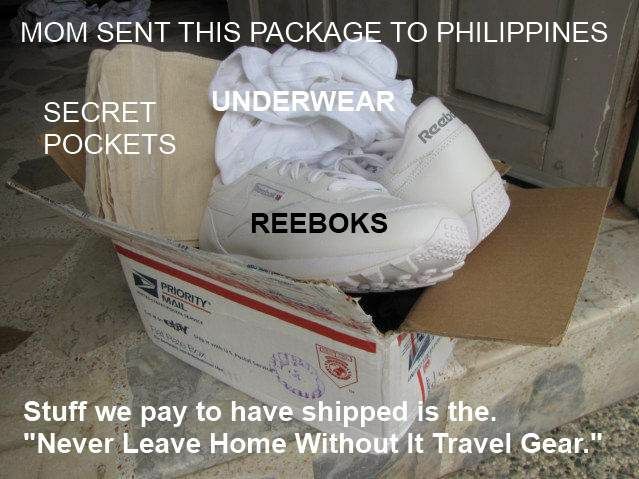 Reeboks Gym Shoes. I am never happy unless I have my Reeboks with me; they are my choice in shoes. 3. Socks and Underwear - 15 years of travel, and it is amazing that underwear is so complicated to buy. 4. Mosquito Net, one night of misery is one night too many, my worst night of sleeping ever was in Bruges, Belgium, and the second worst was in Mantanita, Costa Rica, two times I was without a mosquito net. 5. Secret Pockets, these are the pockets I sew into my pants to replace the money belt, or neck pouch for security. If I forgot them, not possible, they are sown into all my clothes before I leave, then I would stop, and have some made, wherever I am, at whatever cost needed. Losing the 500-1000 dollars I carry with me to a pickpocket is never going to happen to me. - A person living at the destination for longer than one year and not a person who just returned, or lived there 10 years ago. This is again, the million dollar solution, what you need to do is this, find someone who has lived in the travel destination, not a local, never a local; they do not use the same things. If you are American, you need somebody American, or European, but if you are going to Mexico, the last person you want is a Mexican, they do not live the same as you. I called up Johnny, before I want to Sosua, DR and he wanted me to buy a memory chip for a cell phone, because they cost 10 dollars in the USA, and 30-40 in Sosua.